Today's mission is to declutter your storage unit or locker that is off-site, so you can stop paying storage fees each month for clutter that wouldn't fit into your home. Practically, I know that this mission cannot be done completely today, and also that it cannot be completed in one 15 minute session. Instead, today is your day to make a plan for how you'll empty and clear out the storage unit or locker at some point in the future, and then you'll use many more additional decluttering sessions to actually implement the plan. As always, how much stuff you've got in the storage locker or unit, and the unit's size, along with how quickly you can make decisions and dispose of various items, all play a role in how long the project will eventually take. But of course, it takes however long it takes. The time passes either way, and you pay monthly fees for the pleasure of using the space to hold your clutter as that time passes. So you might as well go ahead and start the process of decluttering this space by making your plan today! If you currently pay for an off-site storage unit or locker, at one point I'm sure you believed that paying for extra fees to store stuff outside your home was a good idea. Perhaps you thought you'd only use the space for a few months, before some transition occurred, like a move, and you or someone else would take the stuff back out of storage and begin to use it again. Or maybe you thought renting a space to put stuff would help you remove some of the clutter from your home, which was making the space feel cramped. And like a safety release valve, adding that additional space to where you could store items probably did just that. But I believe that while using a storage locker for up to a few months may make sense in some situations (like when people are moving, for example), I don't believe that off-site storage units are particularly a good thing if your home is just too cluttered to hold any additional stuff, or if you begin to use this storage long-term, such as more than six months. The answer is that, in my opinion, we as a society have too much stuff, which is why we're all so interested in decluttering. We don't need nearly as much stuff as we've got. Almost all of us, except the most strict minimalists, could find items we're holding onto that aren't useful or needed in our homes. Plus, we also need to live within the restrictions we've got, including the size of our homes. If you've got a small home, or lots of people live in it, you've just got to work with the space you've got, and keep reducing the total amount of stuff you've got in your home until it all fits comfortably inside, with room for people to also live there. Further, clutter costs us money and time. I've discussed this point in more detail in my article about how decluttering and organizing your home saves money, but suffice it to say that sometimes the ways clutter costs us money aren't particularly obvious, but in this situation, since you're paying for space to store your clutter, the link between clutter and how much it costs is crystal clear. You work hard for your money. Don't waste it paying to hold onto stuff for more than a few months that you can't even easily access, and therefore aren't using. Get rid of the clutter in your off-site storage unit as soon as you can. As I mentioned, renting a storage unit off-site may make sense in some limited circumstances, for a short period of time, such as a couple of months, but often people pay for these storage units for years and years. A good rule of thumb is that the longer the stuff has been in storage, and therefore definitely has not been used, the more likely it's clutter. It doesn't matter if it was expensive at one time, or could be used by someone. It clearly hasn't been used by you in quite a while, and also if it's worth something, sell it, but don't have it costing you money. 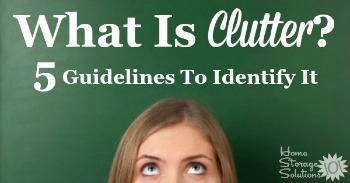 If you're having trouble remembering how to identify clutter, check out this article with 5 guidelines to identify clutter. In the Declutter 365 missions I've grouped all of the missions dealing with decluttering storage areas of your home together into one three week span in the Declutter 365 calendar, including the basement, garage, attic, as well as storage closets and other similar rooms (along with this mission about off-site storage lockers). The reason I've done this is because I know it can take a while to declutter storage areas, and you may not have all of the areas listed above in your home, so even if you aren't working on exactly the storage area we're discussing that day, you can use those weeks that are all grouped together to declutter whatever storage area you've got inside your home, a little at a time, with a big enough time period allotted to make some big progress in it. In many ways decluttering your off-site storage unit is very similar to decluttering any other storage area inside your home. For example, you want to pace yourself, not make a huge mess in the process, and make decisions about items and actually remove them from the space slowly but steadily, so you can make real progress without just shuffling stuff around. While decluttering off-site storage units does bear some resemblance to decluttering those inside your home, there are obvious differences as well. The big difference, of course, is that the stuff you've stored at these off-site locations is not inside your home, but instead is located in a less convenient place for you to deal with. You've got to travel to get to that storage area, and so practically taking just one box at a time, every single day. to deal with may not make sense. There are a two different ways you can approach your strategy for decluttering an off-site location, so I'll discuss them both, and then you can decide which one will work best for you. 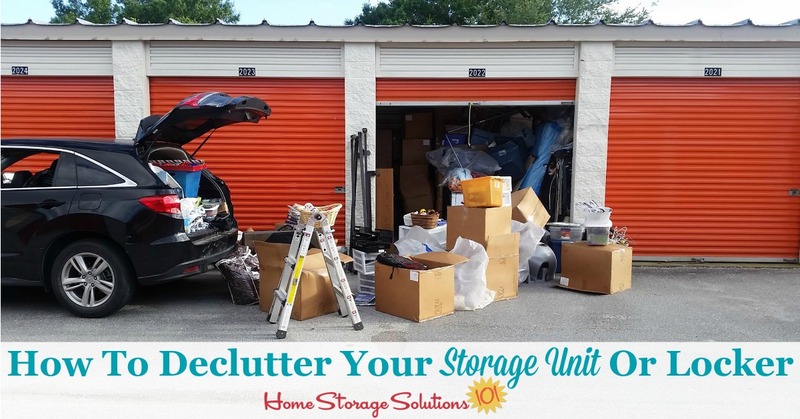 The first way to go about decluttering your off-site storage unit is to head on over to the locker or unit, and begin tackling the stuff inside in a similar way that you would in other storage areas of your home. If you're not familiar with my suggested method for decluttering, please check out this article about how to declutter your home, to understand what I suggest doing to keep from getting overly tired, to not make a huge mess in the process that's hard to clean up, and how to go about making your decisions methodically, one box or one item at a time. 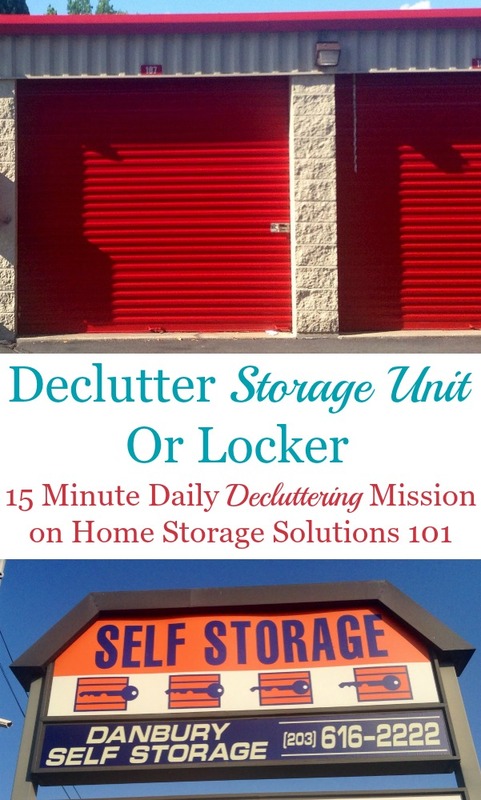 The big difference between the decluttering method outlined in that article and doing an off-site storage unit declutter is that, because the storage unit is not as convenient for you to get to, I suggest you increase the size of your decluttering blocks from 15 minutes, where you declutter and make decisions for 10, and clean up for 5 minutes, to a larger block of time, such as one hour at a time, with 40 minutes of decluttering, and 20 minutes of cleaning up. The clean up period of each hour long block is the time where you take things to the trash or dumpster, bag up items to take to a donation center, or do whatever else you've decided to do with the items you've made decisions about. The clean up period is crucial for actually following through with those various decisions, and getting the stuff removed from the storage unit, a little at a time. Remember, with this decluttering method you also have six choices for an object when decluttering, as listed in the image to the left, and which is explained in more detail in the same how to declutter article. 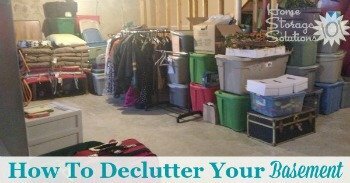 In addition, you can also check out the how to declutter your basement article here on the site for more in-depth discussion of the staging area you should use within storage areas, as you declutter, to keep from making a big mess while decluttering. Depending on how much stuff you've got in your off-site storage unit or locker, one hour long session may not be sufficient (in fact, it probably won't be). That's OK. Keep scheduling one hour sessions, or a small block of these sessions into your calendar as an appointment for yourself, over and over, when you can get over there, to keep dealing with the items until the task is completed. 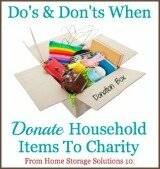 Make sure you're consistently filling up your car with items to take to the dump, or to drop off at consignment, or to donate to a charity, as needed, or listing items for sale routinely throughout the process. 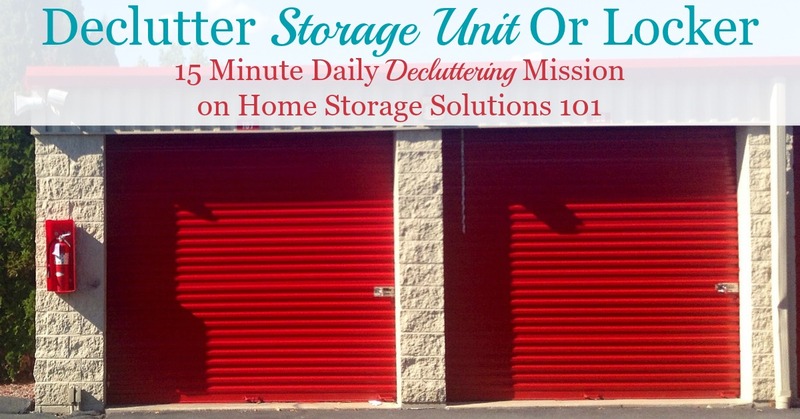 If the 20 minute clean up period within each hour long block is not enough for these tasks, you can go ahead and devote an entire hour long block just to getting rid of the clutter in the storage unit, so you're making real progress. Just keep rinsing and repeating these steps, over and over, until the unit is empty and you can declare victory. 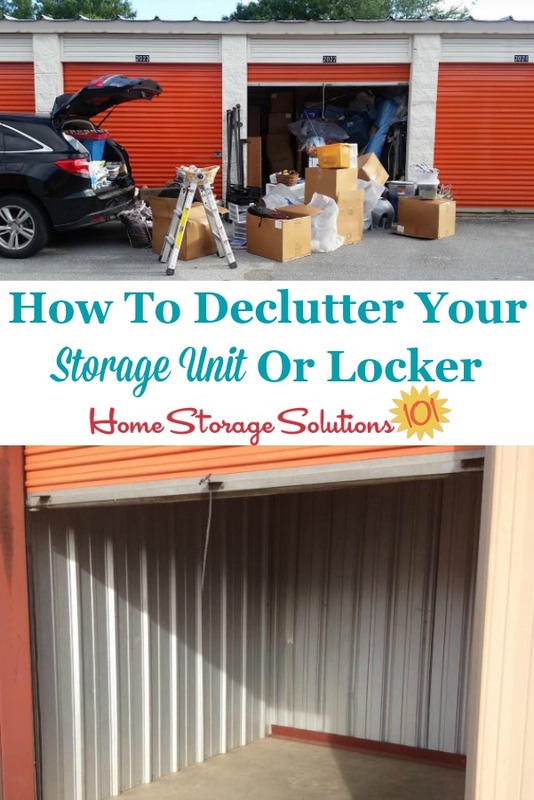 Depending on how frequently you have time and energy for these hour long decluttering blocks, this process may take a while, but the storage locker will keep getting emptier and emptier, as you devote the time to the project. The first alternative method means you may be paying for that storage unit for several more weeks to months, depending on how quickly you can go through the items contained in it. If, on the other hand, you want to stop paying for that storage unit quickly, the alternative is to pack up all the stuff stored in the unit, bring it to your home, and then begin to sort through it there. Of course, this only works if you've got space in your home to store these items, at least in the short-term, so if this is the beginning of your decluttering journey and your house is full, this second alternative simply won't work for you right now. On the other hand, if you've been working on the Declutter 365 missions for a while now, and have already decluttered another storage area in your home, such as removing a lot of stuff from your basement, or garage, or attic, you might find you now do have room to bring this stuff home and basically re-start the process of decluttering all over again, just now with stuff from the storage unit. I do not suggest you bring all this stuff home if you don't have a non-living space storage area to place it into. If, instead, you'd have to place all this stuff in the middle of your living room, for example, where everyone will be tripping on it, and stubbing their toe, and generally having the stuff in the way, don't do it. If you did you'd be creating exactly the type of scenario that makes everyone unhappy, because of the large amount of clutter added into the house. Check out these photos below, sent in by Declutter 365 participants, who have worked on decluttering their storage units. The top image in the collage below is from Jennifer, who stated, "I've got 2 of these units to clear out. I sent 2 large bags of clothes to Goodwill, 2 contractor bags to the trash, 6 boxes emptied and recycled, about 20 loads of laundry washed and folded, and ONE item sold. Well... I got started, at least." As you can see, she used the first decluttering method, where she worked on decluttering right at the storage unit itself, in stages, and made sure to deal with the items she made decisions about soon after deciding, so things kept leaving the locker. Then, in the second photo of the collage, which is from a reader, Elizabeth, she cleared out the storage locker all at once, using the second method of decluttering mentioned. 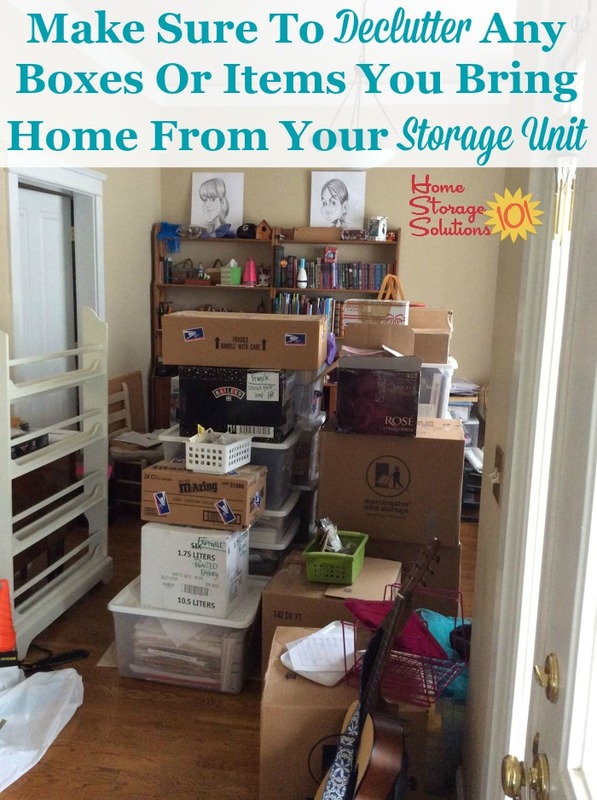 She said, "10 X 12 storage unit emptied," and she was thrilled to have it all gone. I've made the assumption through most of this article that a lot of the items within your storage unit will actually be clutter, that you'll want to get rid of, instead of keep. Overall, I think that's a fair assumption to make, but there may be stuff in the storage unit you do want to keep, and were waiting to bring some of it back into your house once you'd decluttered enough other stuff to have storage room for it within your home. To the extent that's the case, that's totally fine. You ultiamately get to choose what you store inside your house. Just make sure that as you bring various items home from your storage locker or unit that you actually put these items away in designated storage areas, or for use in your home, instead of just bringing home piles, bags and boxes into your home to sit as junk in a new location. The photo below was sent in by a Declutter 365 participant, RS, who said, "I got 90% of the boxes out the storage unit, still have to get the last few and all the furniture, not sure where to put it. BUT hoping to save $100 month. I will be working my way through these boxes over the next few months. Many of these are photos or other keepsakes, not sure how to deal with them while still between rental home and permanent home. Sigh." As you can see from RS's photo, bringing a bunch of stuff home can re-clutter up a cleaned up area of your home. That's OK as long as it's just for a little while, but make sure to work in 15 minute chunks inside your house, dealing with the stuff you bring home, to make sure any clutter you bring home is just temporary. Celebrate Your Accomplishment When You're Done! 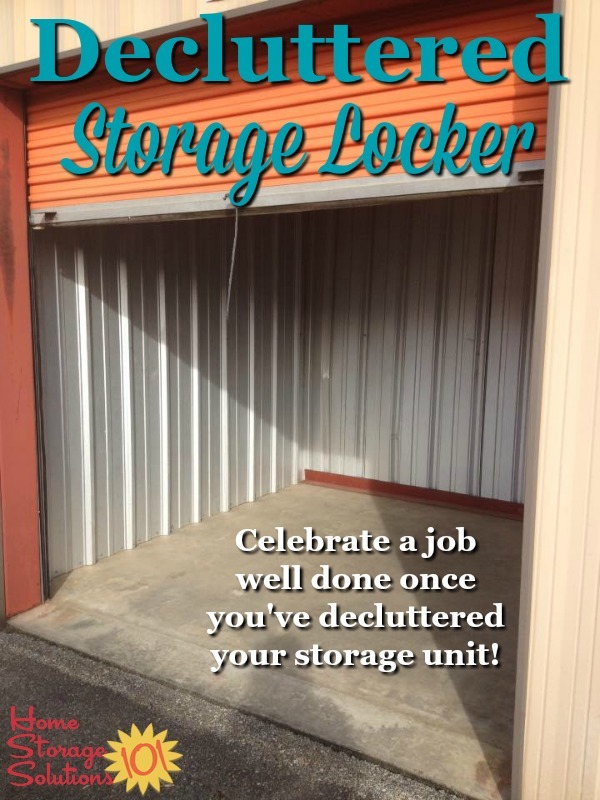 Finally, once you've cleared out that storage locker or unit, and you're no longer having to pay that monthly rental fee, make sure to celebrate because that's a HUGE victory. Look at this photo of the empty and decluttered storage locker sent in by Elizabeth, below. After you put in the work you too can accomplish that, and you'll have earned that celebration! I hope seeing these pictures has inspired you to get the clutter out of your storage locker or unit. After you've got all those storage areas decluttered, you may find you've got way too many now empty storage containers. 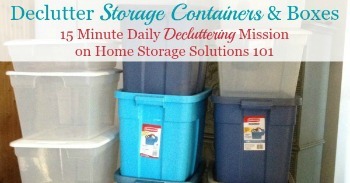 Check out this mission for how to declutter empty storage containers here.